When the five "Thea Sisters" get a package from their friend Jenna in the mail at their boarding school, they decide to take Jenna up on her invitation and jet to Hollywood. Once there, they get to see many famous sites and go roller skating as well. Since Jenna's sister Terri is working on the set of a film starring the dashing Johnny Ratt, the girls decide to tag along and see the film being made. Mysteries start popping up-- Princess Lane has gone missing, and the girls think they see her in one of the photos taken of the set, and one of the film reels has gone missing, which would put the film even further behind schedule. The Thea Sisters start investigating, and the reader is encouraged to help them. Pages with a magnifying glass recap the clues and help the reader with the investigation. Eventually, the girls find Lane, and realize that her mystery is entwined with several others. 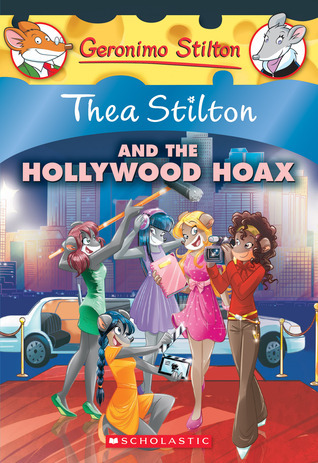 There are many different series within the Geronimo Stilton franchise, and this subset seems aimed at readers who are intrigued by celebrity stories and fashion. The Thea Sisters have a little more friend drama occurring, and fewer goofy, humorous incidents involving gross things. The story moves quickly, and the characters are not well developed, so it helps that each of the girls has a particular interest (violin, sports, cooking, etc.). The real draw of these books is the use of color and engaging fonts on each page, along with the full color illustrations. Everything turns out well in the end, and the Thea Sisters claim Lane as one of their own, telling her that "true friends are forever". Readers who have outgrown Babymouse and want a series with a lot of books will do well to check out this branch of the Geronimo Stilton series. Geronimo receives an invitation from Creepella, a writing colleague, to go see her famous cousin, Violetta perform in an opera with an assortment of friends and family. When they arrive at the theater, they find that someone has given Violetta chocolates that have made her incapable of singing the high notes she must reach for the performance. Geronimo starts investigating all of the spooky, odd things that are going on at the theater. There are lots of creepy secret passages filled with cobwebs, gross snacks of bugs and slime, and apparitions popping out of doorways and wall panels. In the end, Geronimo is able to find out who gave Violetta the candy, reverse the damage, and enable the show to go on. This full color, illustrated novel has plenty of pictures on each page, and key words are printed in fancy fonts in a variety of colors. There are even full page spreads of pictures when there are clues to be found or puzzles to be worked out. There is a page of musical riddles with the answers provided upside down on the following page. While the mystery isn't overly sophisticated, the story provides clues so that readers can attempt to solve it. There are lots of characters to remember, and the general tone of this is frenetic. Sound effects like moans and singing are splashed across the pages in colorful fonts, and funny phrases like "abso-mousely" pepper the dialogue. 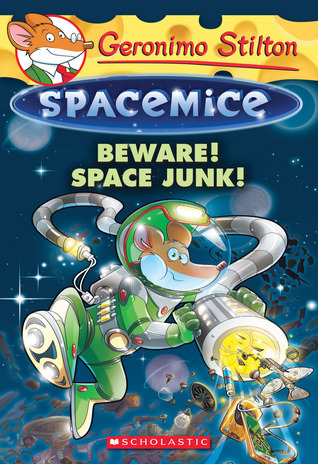 I'd love to know how "fabu-mouse" is rendered in the original Italian. 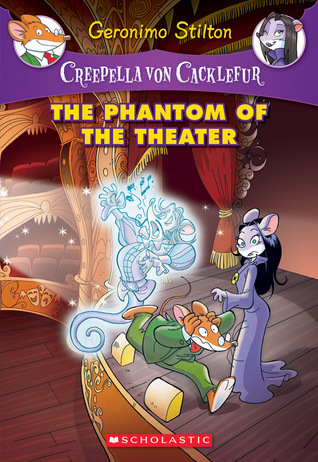 Aficionados of Goosebumps who make frequent forays into the pages of Babymouse or Squish will be delighted with this Addams Family type adventure with the Geronimo and his fellow writer, Creepella von Cacklefur. This seemed like it would bring in more philosophy to this series, and perhaps teach a lesson about consumerism and recycling, but the deus ex machina ending just brought in the Sortrix to wipe out the problem with little effort. I was a little disappointed, but readers are not really going to care . 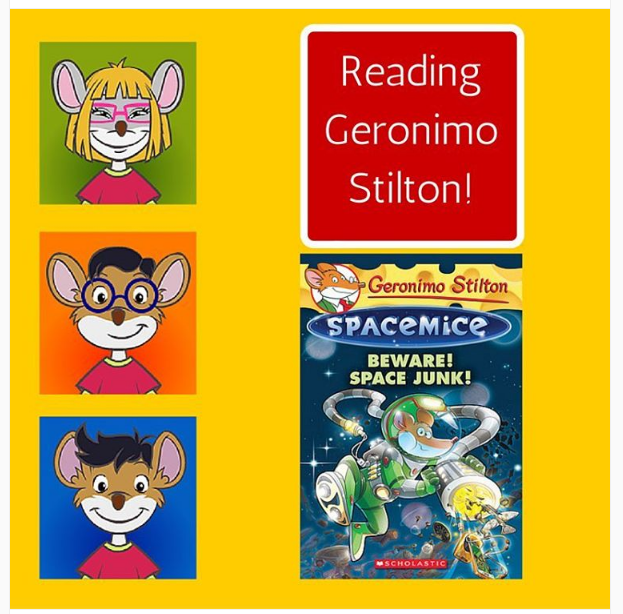 Why so many Geronimo Stilton books? I have a few in my library, but don't really need that many. When the chance arose to review them for Young Adult Books Central, however, I knew that I had to have copies to give to two of my readers who adore them. They'll make good summer reading. You have to love the Philosophy of Geronimo Stilton. It sounds rather like the "educational television" constraints that lead to the really bizarre topic choices in the "Weird Al" Show back in the 1990s.